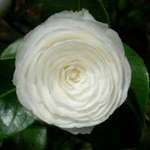 White, formal double flowers that open flat, showing no stamens. Slow growing, with a dense, upright habit. Flowers March to April. I am giving five stars for excellent communication, plant packaged extremely well,efficient method of delivery and above all a lovely plant which I can't wait to see in my garden. I was also very appreciative of the very clear care instructions received. I would have no hesitation in recommending Trehane. This Camellia arrived days after the order was placed, a very healthy plant with a lot of new growth.